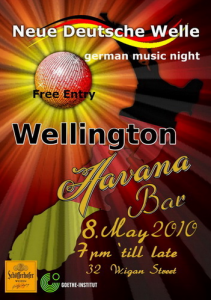 See you at Havana Bar in Wellington on Saturday 8th of May. Start at 7pm and the party will go on ’till late. Es wird Schöfferhofer Weizen geben. Wer Musik beisteuern möchte möge die als MP3 file mitbringen. This entry was posted on Samstag, April 24th, 2010 at 07:03	and is filed under Sport & Freizeit. You can follow any responses to this entry through the RSS 2.0 feed. You can leave a response, or trackback from your own site.